Your Brain Is Like A Symphony: It Needs To Be In Tune To Function Properly. We all have 4 primary brainwaves that control our brains. Delta waves regulate sleep. Beta waves affect our critical thinking skills. Alpha waves control our subconscious and Theta waves guide our emotions. However, when these brainwaves start to run too fast or slow it can affect our ability to function normally. Without help, symptoms like depression, stress, ADHD and sleep problems can start to appear. We Can Help Tune The Brain Safely. We specialize in brain focused wellness using modern technology to map the brain and accurately identify problem areas. We combine brain training programs like neurofeedback with nutrition and other modalities to correct brainwaves and heal the whole body. When the brain works, the body responds! ADHD is perhaps the most common diagnosis in school age children. Problems with attention and learning, as well as emotional outburst are quickly given the ADHD label. Most doctors will treat systems with drugs like Ritalin, Adderall, Concerta and Strattera. But these drugs only mask symptoms: They do not solve the underlying problem. Neurofeedback is a safe, non-invasive system that corrects irregular brainwaves while your child is engaged with a movie. It's like exercise for the brain. The result is better brain function, which can improve or eliminate symptoms and improve learning abilities. Studies show that Neurofeedback results can last 30 years or longer and may even increase IQ by 10-12 points. Neurofeedback has been approved by the American Academy of Pediatrics as a Level 1 or "BEST SUPPORT" treatment option for ADHD and learning disabilities. There are over 1600 studies that demonstrate the effectiveness of neurofeedback training, and is currently used by thousands of licensed health professionals throughout the world. It could be the most important new tool for mental and neurological health available today. How Do We Determine Your Condition? 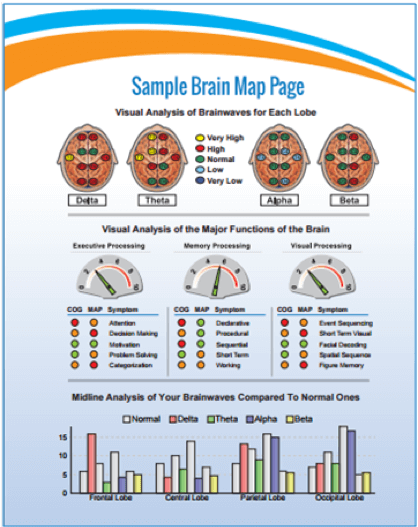 The brain map is able to capture a window of brain activity, analyze the data and create a visual representation for each lobe of the brain and each specific brainwave (Beta, alpha, Theta, and Delta). Your EEG recording is uploaded to a database and compared to similar individuals with healthy brain activity. Cognitive and emotional issues are identified, as well as irregular brainwave patters. Customized training protocols show what areas of the brain to focus on and train into healthy patterns. Training sessions are 30 minutes and pleasant. You watch a movie or listen to music of your choice while wearing our photic light glasses. The computer monitors brainwaves and gently guides brainwaves into healthy patterns. The average number of sessions is 20-40, usually 1-3 times a week. Results are often permanent and no further training is needed. Research and clinical studies show that many cognitive situations unresponsive to medication or psychotherapy can be resolved with neurofeedback in 20-40 sessions. Some chronic disorders spanning many years, including those complicated by substance abuse, can show improvement after just one session! Neurological behaviors are the result of the energy in our brains: excess Beta can produce anxiety, too much frontal Alpha can result in depression, and elevated Theta can produce ADD. Re-training brainwaves allows the central nervous system to learn how to self-regulate, directing it away from debilitating, painful, destructive disorders. *Disclaimer: This product is not indented to diagnose, treat, cure, or prevent any disease.